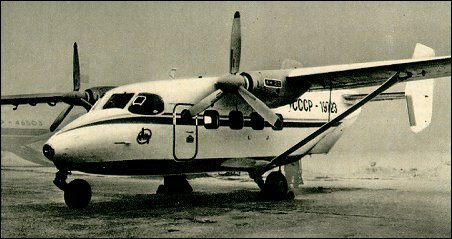 Carrying the NATO reporting name Cash, the An-28 is a development of the piston-engined An-14. It is a short-range twin-turboprop light general-purpose aircraft, expected to enter production with WSK-PZL-Mielec of Poland in 1980. The first prototype flew in September 1969 and had a retractable landing gear and Isotov TVD-850 engines. The An-28 now has a non-retractable tricycle type landing gear and two 723kW Glushenkov TVD-10B turboprops. A much larger cabin accommodates up to 19 passengers or a variety of alternative payloads, including scientific, medical or agricultural spraying equipment. We have two An28 available for lease(asg-aero@hotmail.com) possible for skydive. We have two An28 available for lease, possible for skydive. looking for 6 antonovs for purchase. if you can find them or have access we are interested, Unless they belong th Peter K . Spitxz with whom we do not desire a business relationship. Dear Mr. Rakhman, I have best An28 with full history for sale + stock of spares. Dear Madam or Sir Maier, we (my client) can offer PZL M 28 Aircraft Version 05 with full EASA TCDS. If you are real interest contact me via AN28forsale@aol.com to give a direct contact to this offer. I am interested in leasing An-28 equipment for an operation in the Middle East. Please kindly contact me if you have availability on this Aircraft. Thanks very much.